This island ranks #3 of the "Lesser Sunda Islands"
The island has many hotels - rather inexpensive in average. Most hotels are located on the eastern shore of Trawangan island. Fly to Denpasar International Airport (DPS). Next, take a ferry from Padang Bai pier (1 h 15 min) or take a ferry from Serangan pier (2 hours), which is located on the popular peninsula of Nusa Dua. 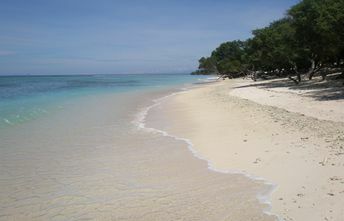 The best time to visit Gili islands is the dry season - from April to October.